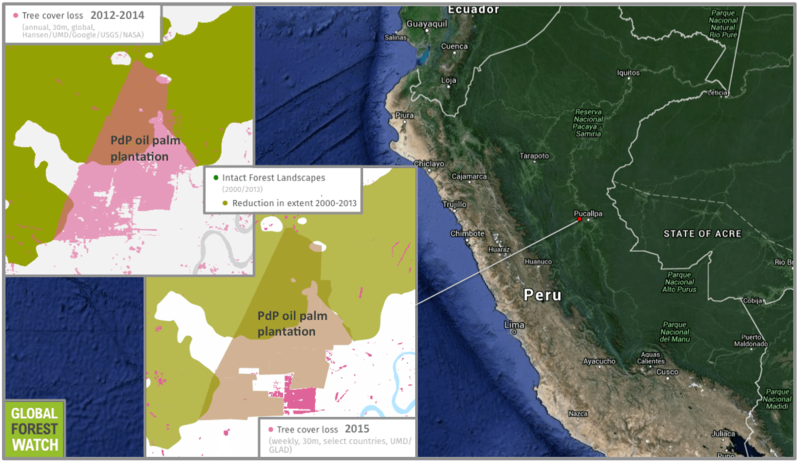 Two big palm oil plantations in the Peruvian Amazon have attracted the attention of conservation and human rights organizations that say their development has resulted in the destruction of rainforest and harmed surrounding communities. On April 25, the Roundtable on Sustainable Palm Oil responded to these allegations, issuing a “stop work order” to Plantaciones de Pucallpa – the company managing one of these plantations – on the specific grounds that its operations are affecting the territory of the Shipibo community.Starting in earnest in 2012, Plantaciones de Pucallpa’s oil palm plantation in Peru’s central Ucayali region had deforested around 6,000 hectares by the end of 2014, according satellite data from the University of Maryland. Nearly half of this clearing took place in a particularly large, continuous area of primary forest called an Intact Forest Landscape. Data from 2015 indicate 400 more hectares were cleared last year. Plantaciones de Pucallpa’s oil palm plantation near the town of Pucallpa has experienced high levels of forest loss over the past four years. Much of this has occurred in an Intact Forest Landscape, which does not represent the full extent of primary forest. Analysis by researchers in 2015 concluded that primary forest covered most of the plantation’s area before clearing began in 2012. The Roundtable on Sustainable Palm Oil (RSPO) is the world’s primary international certification organization for assessing sustainability standards in palm oil production. The RSPO’s stop work order follows an official complaint filed in December 2015 by the Santa Clara de Uchunya community against Plantaciones de Pucallpa for destroying over 5,000 hectares of their ancestral forest lands. The company’ activities, according to the complaint, are having devastating impacts on the rivers and forests on which the community’s subsistence livelihood depends, while also destroying community dwellings, and restricting community members’ access to the forest. According to the RSPO’s complaints panel, Plantaciones de Pucallpa is in non-compliance with the RSPO’s principles including failing to respect customary land rights and clearing primary forest. In addition, the panel alleges the company has also breached its New Planting Procedure (NPP) which requires notification before developing new plantations and that companies conduct environmental impact assessments, as well as initiation of Free, Prior and Informed Consent (FPIC) processes with affected communities. The complaint asserts that no such FPIC attempt was made by Plantaciones de Pucallpa with the people of Santa Clara de Uchunya. The RSPO order and the community’s formal complaint are not the only warnings that Plantaciones de Pucallpa has been handed. The Peruvian government itself ordered the suspension of this company’s operations in September 2015 until such time as the company could prove through credible environmental studies that the land used for its plantations is suited for agriculture. However, members of the Federation of Native Communities of the River Ucayali (FECONAU) have reportedly said that this federal stop work order has not been enforced. Deforestation in Peru has been increasing, with around 2 million hectares of tree cover lost in the 15 years between 2001 and 2015 – an area bigger than the U.S. state of Connecticut. In response, Norway and Germany pledged nearly $300 milllion to combat deforestation in the country and help it achieve “net zero” deforestation by 2021. The main drivers of deforestation, according to Peru’s Environment Ministry, include the expansion of commodity crops like coffee, cacao and African palm oil. Ucayali itself, where there are two large oil palm plantations and several smaller plantations, as well as cattle ranches, has lost more than 80,000 hectares to deforestation activities. 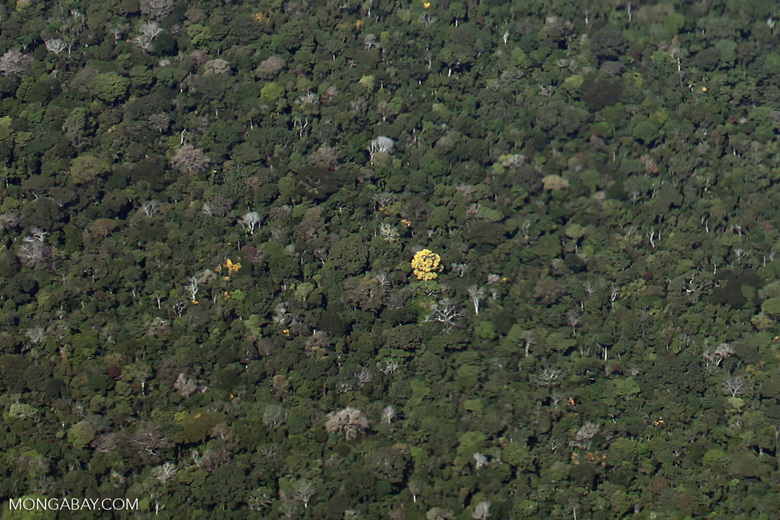 A tree flowers yellow in the Peruvian rainforest. Photo by Rhett A. Butler. 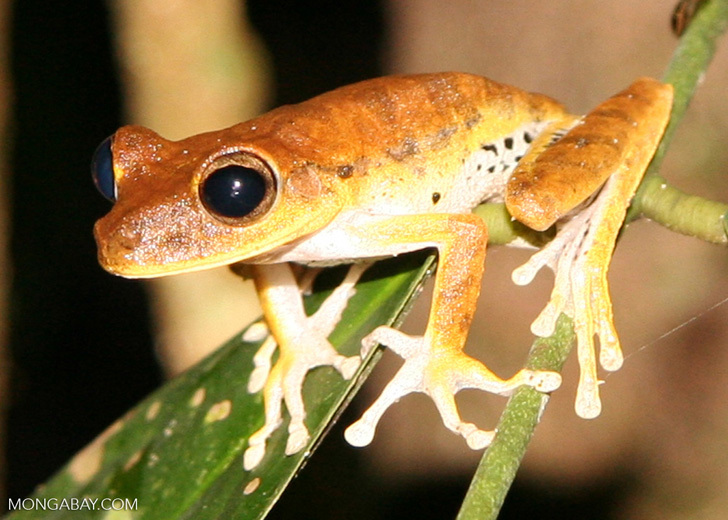 Peru’s forests are home to many species, like this Hyla tree frog. Photo by Rhett A. Butler. In addition to the loss of land, residents of local communities and activitists also risk losing their lives by standing up against perceived injustices. Washington Bolivar who has been working with the Shipibo community to oppose the destruction of “traditional forests,” reports receiving near constant death threats. Others have been murdered, such as Edwin Chota in 2014, making Peru one of the most dangerous places on earth for environmental activists. In light of what it says are unfounded legal accusations made against community leaders by the company, the RSPO complaints panel, while issuing its latest reprimand to Plantaciones de Pucallpa, reminded the company that intimidation of communities is illegal. The company has 14 days by which to comply with RSPO’s terms. This includes demonstrating that it has satisfied all legal requirements in acquiring, clearing and planting concession areas, and that in establishing its plantation, it has not cleared any primary forest or areas of high conservation value. Until the company can provide evidence of compliance, it has been prohibited from carrying out any clearance or planting activities. Palmas del Peru, a company with financial ties to several plantation companies in Peru refutes allegations that Plantaciones de Pucallpa is responsible for primary forest deforestation and that it has taken over the land of local communties. In a translated e-mail interview with Mongabay, Institutional Relations Manager Ulises Saldana said the plantation area is not part of Shipibo territory as the community holds no legal title to the area and documents show that it was not occupied by Shipibo ancestors. Saldana said Plantaciones de Pucallpa is actually enganged in positive relations with several local communities, naming specifically the Shambo Porvenir who live near the contested plantation. He pointed to YouTube videos uploaded by “PAPE Palmas” that purport to show residents of local communities lauding Plantaciones de Pucallpa and calling on the RSPO to reconsider its decision. “We can say they are a private company sent from heaven,” reads the English subtitles of a video published May 3 allegedly showing Sixto Gomez Ochavano, a chief of the Shambo Porvenir communitity. Another video published May 4 shows a man who describes himself as a Lieutenant Governor from the nearby village of Caribe. He says, according to the video’s English subtitles, that Plantaciones de Pucallpa did not clear primary forest because the area was logged in the 1970s. However, 2015 analysis of satellite data by the Monitoring of the Andean Amazon Project strongly indicates that most of the clearing for Plantaciones de Pucallpa’s oil palm plantation did take place in primary forest. Plantaciones de Pucallpa and the other major plantation in Ucayali called Plantaciones de Ucayali SAC are both owned by the same parent companies – United Cacao Ltd. and United Oils Ltd. These are just two of many companies in Peru with links to a complex corporate network controlled by Czech businessman, Dennis Melka, who is also founder of the Malaysian agribusiness company Asian Plantations. Melka’s companies in Peru have been spotlighted several times due to accusations of illegal deforestation and land conflict from palm oil and cacao agroindustry. A week after RSPO’s stop work order against Plantaciones de Pucallpa, a call came from more than 60 indigenous organizations and NGOs from Peru, Europe and the United States to remove United Cacao from trading on the Alternative Investment Market (AIM) of the London Stock Exchange. 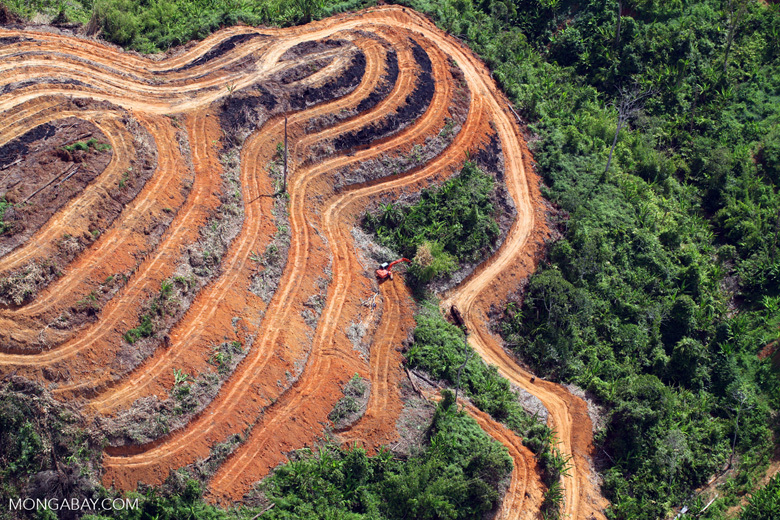 Deforestation for palm oil in Sabah, Malaysia. Photo by Rhett A. Butler. In this latest development, the group said the basis for its demand was that United Cacao Ltd. was in violation of AIM rules and was involved in illegal clear-cutting of Peruvian rainforests. In a letter to the London Stock Exchange and UK market regulators, the groups made clear connections between money raised on the Alternative Investment Market and at least 11,100 hectares of illegal deforestation in the Peruvian Amazon by United Cacao’s direct subsidiary, Cacao del Peru Norte, and related companies Plantaciones de Pucallpa and Plantaciones de Ucayali. Each of the three Peruvian subsidiary companies has received a significant amount of money from United Cacao, which is listed on the AIM. Groups also called on UK regulators to investigate whether United Cacao’s violation of AIM rules have also breached other UK laws or regulations. The EIA says the consortium’s letter highlights London’s role in global finance and represents an outcry by civil society against abuses related to land acquisitions and plantation development of cacao, oil palm and other agro-commodities at the expense of forests and community lands.